In November of 2013, Mr. Kilolo and three other members of the Bemba defense team were arrested. Bemba was already in custody on the main case. 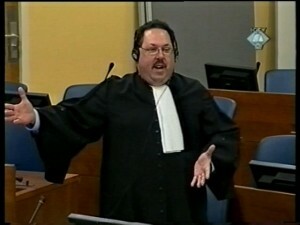 Mr. Kilolo remained in custody in The Hague, seat of the ICC, for the next 11 months. Kilolo and the others were charged a few weeks later with offences against the administration of justice. Essentially, this case was about witness and evidence tampering. Trial commenced in September of 2015 and concluded the following May. The judgment convicting all five accused was delivered in October 2016. Mr. Kilolo, specifically, was convicted of corruptly influencing witnesses, presenting false evidence and inducing false testimony. experience at the United Nations International Criminal Tribunal for the Former Yugoslavia (ICTY) in The Hague, and the so-called Khmer Rouge Tribunal (Extraordinary Chambers in the Courts of Cambodia) in Phnom Penh, Cambodia, made him a valuable addition to the team. Sentencing was briefed and argued, and the judgment of sentence was delivered on March 22, 2017. Mr. Kilolo was sentenced to two and one-half years of imprisonment, with credit for time served and the remaining period of imprisonment suspended. He was also ordered to pay a fine of 30,000 Euros. The Prosecutor appealed all the sentences, while the co-accused appealed their convictions. Mr. Kilolo did not appeal. After extensive briefing, the ICC Appeals Chamber issued its judgment in March of 2018, finding that there was no authority for suspending sentence under the ICC’s legal framework and reversing certain of the grounds on which the sentences were based, but vacating one-third of the convictions. The matter was then remanded to the Trial Chamber for resentencing. The Kilolo defense team briefed the issues on resentencing and prepared for oral argument on re-sentencing. 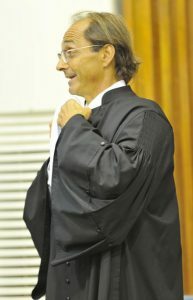 In a further attempt to blunt the criticism of the Prosecution in the Main Case, on the eve of the scheduled sentencing hearing, the Prosecutor made submissions in support of resentencing asserting that Bemba’s acquittal by the Appeals Chamber was a result of the witness tampering conduct. The re-sentencing hearing was held on July 4, 2018, after which Mr. Kilolo and the other convicted persons were given leave to respond to the Prosecutor’s submission. As I sat there listening to the presiding judge read a summary of the judgment, I was surprised and pleased to hear the chamber adopting many of the arguments we had made on key issues in our briefs and at oral argument. The Chamber is not persuaded by the Prosecution’s arguments to the extent that, now that the suspended sentences are not possible, none of the considerations justifying them have any further merit. The Chamber based its decision to suspend sentences on Mr Kilolo and Mr Mangenda’s individual circumstances – their personal circumstances, good behaviour throughout the proceedings, and the consequences of incarceration on their families/professional life. There is no indication that any of these individual circumstances no longer apply. The Kilolo and Mangenda Defence instead offer further proof bolstering the Chamber’s original findings.4Re-Sentencing Judgment, ¶¶ 51. The Chamber did not mechanistically conclude that the overlapping conduct led to the Article 70(1)(b) convictions having no impact on the joint sentence. Every conviction mattered in the Chamber’s individualised determinations. Accordingly, the Trial Chamber found that because it had considered the cumulative effect of the convictions in imposing the original sentence, it was required to accord some weight to the fact that 14 of those convictions have been reversed. Finally, the Trial Chamber considered the fact that even though the suspended period of incarceration no longer had any legal effect, the fact that Mr. Kilolo had been on de facto probation and had abided by all the terms of his suspended sentence, and behaved constructively and cooperatively. These, the Trial Chamber concluded required consideration as part of Mr. Kilolo’s individual circumstances, an essential element of sentencing under ICC law. As a result, Mr. Kilolo was sentenced to the 11 months incarceration he had already served, and the same fine imposed in 2017. Time served sentences and the same fines were also imposed on the others. The Prosecutor has 30 days from the date of the sentencing judgment to decide whether to appeal, but for now, the core rationale of the original sentence is preserved, while Mr. Kilolo, who has paid the debt for his conduct not just through incarceration, but in many other financial, personal and professional ways, is free to move on with his life. Alan is a lawyer’s lawyer. His work in testing our assumptions, insisting on clarity in our prose, and adding punch to our arguments, was an invaluable element of our success in obtaining and preserving an appropriate sentence for Mr. Kilolo. Update 21 October 2018: The Office of the Prosecutor allowed the deadline to pass without filing an appeal of Mr. Kilolo’s sentence. Next Next post: Yatvin co-counsels suit against New York Department of Education on behalf of students with diabetes.